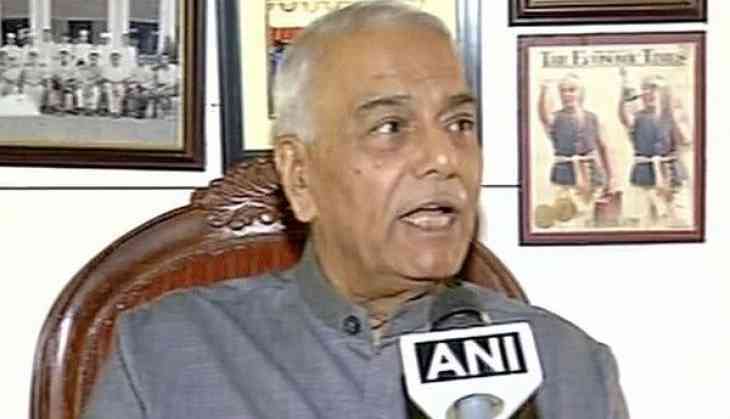 Questioning Pakistan's constantly see-sawing stands on matter pertaining to India, especially in the case of Kulbhushan Jadhav's sentencing, senior BJP leader and former union minister Yashwant Sinha called on the Centre to keep the steady pressure on Islamabad, but not stoop to their level in dealing with the law. "Sartaj Aziz said himself that there is no case against Jadhav. And now he is to be hanged on the basis of his confession and that too by a military court? That's simply wrong. People like Kasab were given a fair trial, whereas Jadhav was given a military trial," Sinha told ANI here. Stressing on India's need to raise an alarm in the international forum and highlight Pakistan's habit of countering India's questions with baseless facts, the former union minister asserted that India needs to act quick to ensure Jadhav does not suffer the same as Sarabjit Singh. "But come what may, we should never stoop to the level of Pakistan in our legal systems. Pakistan is always ready with answers in the form of counter question and this trend has been following since 70 years," he said. Further opining that merely declaring Pakistan a 'terror-state' was not the solution, Sinha stated that one needs to go beyond labels and completely cut off all ties with Islamabad. Talking about boosting India's defence systems in place to check infiltration from Pakistan, Sinha said the Centre needs to have a system similar to that of the American Homeland Security, which will ensure zero infiltration from Pakistan. "We put up barbed wires, they dig tunnels. Clearly, we need heightened vigilance. There should be no limit to the amount of money spent on defense especially vigilance as there is nothing bigger than the nation's defence," Sinha said. Earlier, slamming Pakistan military court on issuing the death sentence to Jadhav, External Affairs Minister Sushma Swaraj on Tuesday issued a stern warning to Pakistan, saying Islamabad should be wary of taking such an extreme step as it could result in damaging the bilateral relations. "There is no evidence of wrongdoing by Jadhav. If anything, he is the victim of a plan that seeks to cast aspersions on India to deflect international attention from Pakistan's well-known record of sponsoring and supporting terrorism... I would caution Pakistan's government to consider the consequences on our bilateral relations if they proceed on this matter," Swaraj said in a statement in the House. Meanwhile, stating that Jadhav had the right to move the army's court of appeal against his conviction within 60 days, Pakistan Defence Minister Khawaja Mohammad Asif has ruled out immediate execution of the Indian national convicted on charges of being a spy. Speaking in the Senate, Asif claimed that Jadhav had the right to move the army's court of appeal against his conviction within 60 days, followed by submission of mercy pleas to the army chief and the president, the Dawn reports. Are Tiger Shroff and Disha Patani living together? READ NEXT >> Are Tiger Shroff and Disha Patani living together?